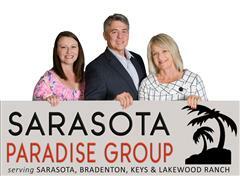 THE SARASOTA PARADISE GROUP - 2018 Craig & Brenda have successfully listed HOMES & CONDOS located in LAKEWOOD RANCH COMMUNITIES, and WATERFRONT, BEACHFRONT, GOLF COURSEs including many unique properties requiring their customized expertise. Many of their clients have relocated from around the globe including year-round and part-year owners. Craig is a Broker Associate and earned the Certified Luxury Home Marketing Specialist and the Certified Distressed Property Expert designation, and is also a New Home Specialist. Brenda is a licensed Realtor and earned her Certified Luxury Home Marketing Specialist along with numerous other designations. The Wilson's have a proven success record with tremendous staff & systems. As top listing agents, their marketing plan is professional, proven and includes an aggressive multi-pronged internet marketing campaign. Married since 1984, Brenda & Craig were both raised in upstate New York near Binghamton, where Craig graduated college with an accounting degree. After remodeling several homes of their own, they moved to Virginia Beach in 1986 to partner a start-up financial service business ALMOST A BANC, offering check cashing, money orders, Western Union and packaging services. Building to 19 locations with over 120 employees and gross revenues in excess of $3 million per year, they sold the company in February 1992 to a Bear Stearns subsidiary. Craig held his Virginia Real Estate license and negotiated dozens of commercial leases for check cashing & tax centers. In 1991, Brenda & Craig started Quick-File Tax Network (similar to H & R Block tax preparation centers). Quick-File Tax Network quickly expanded to 29 offices in Virginia & Maryland – offering Tax preparation services & refund loans. With 100+ employees each season, they processed 4,000 – 7,700 tax returns per season, and then sold the business in 1995. Their custom designed FEEBASE database, training & form kits were licensed by Mellon Bank for use by thousands of other tax offices around the country for several years. In 1994, Craig went to work as a Sales representative for McCarthy Enterprise that included relocating to Rockport, Texas and lots of travel, selling time management systems & journals to manufacturers of leather & vinyl planner covers. During this same time frame, Brenda started her career in Real Estate, working for Coldwell Banker, and then moved to a small luxury brokerage Key Allegro Real Estate in Rockport. Brenda was a Rookie of the Year in 1995 proving herself a valuable asset receiving various awards for top production. In July 1999, the Wilson's made their move to Tulsa, Oklahoma to pursue Bible College for Craig and start their real estate career together. Craig graduated Bible School and worked part time as a Children’s Pastor for 3 years. During this same time, Brenda & Craig quickly evolved into a top real estate team averaging over 60 sales per year in 2000-2004. During their last year in Tulsa, the Wilson Hometeam was the number one Keller Williams Real Estate team in the Tulsa Market with 80 sales. Systems were fine tuned, followed by many happy buyers and sellers. In July 2004, the call of the sunny Gulf Coast climate and sales opportunities led Brenda & Craig to relocate to Paradise on Florida’s gulf coast in the Sarasota-Bradenton area. They transferred to Keller Williams Realty Select and have consistently earned many top production awards annually for the past 13 years. Craig and Brenda's team continues to evolve as their daughter, Jessica Coay, became team administrator in 2016 – working at the office 3 days a week. In 2017 she activated her real estate license and has now joined the team working with buyers and sellers. In 2017, they joined with Fine Properties and have also hired Judi Wilson as a full-time team administrator. The Sarasota Paradise Group gives you the advantage of having multiple agents to hold open houses, show property, and watch the market continuously to assist our clients navigate their real estate needs! If you’re considering selling or buying a property, let Brenda & Craig show you the benefits of working with an experienced team with a proven plan for maximizing your return. Call Craig & Brenda at (941) 321-8686.